Attorney Rick Salinas speaks during a press conference Wednesday inside his law office in Mission. MISSION — A man working for a campaign during the Mission elections came forward to accuse a woman of lying on the witness stand during the trial for the Mission election contest, which resulted in the mayoral runoff ruled void last week. Marco Perez, who worked for Mission city council candidate Julian Gonzalez’s unsuccessful campaign, is denying Esmeralda “Esmer” Lara’s Oct. 2 testimony alleging that Perez promised her $1,500 if Lara, who other witnesses described as a politiquera, worked for Gonzalez and Norberto “Beto” Salinas. Gonzalez and Beto Salinas ran on the same slate in the May election and June runoff. “My client wants to make it very, very clear that all of her testimony regarding Mr. Perez was completely and absolutely false,” said Perez’s attorney, Richard Gonzalez. Gonzalez made the comments on behalf of Perez during a news conference Wednesday morning at attorney Rick Salinas’ law office in Mission. Salinas represented his father, Beto Salinas, during the trial. Multiple attempts to reach Lara for comment were unsuccessful. During the trial, though, she testified she originally volunteered to work for the Armando O’Caña campaign for no pay but was persuaded to help the Beto Salinas campaign during the 35 days between the general election and the runoff after being told that doing so would land her a higher-paying job with the city. Lara currently works as a custodian for the Mission school district. Perez stated in the affidavit that he met with Lara, at her request, on May 11, where she showed him a notebook with a list of names and addresses of registered voters whose ballots she’d allegedly handled. She allegedly told Perez that they were willing to work on Julian Gonzalez’s campaign for $6,000. Then on May 21, according to his affidavit, she sent him a picture of mail-in ballots. By publicizing Perez’s affidavit, a clear contradiction of Lara’s testimony, his attorney alleged she perjured herself on the witness stand during the trial. 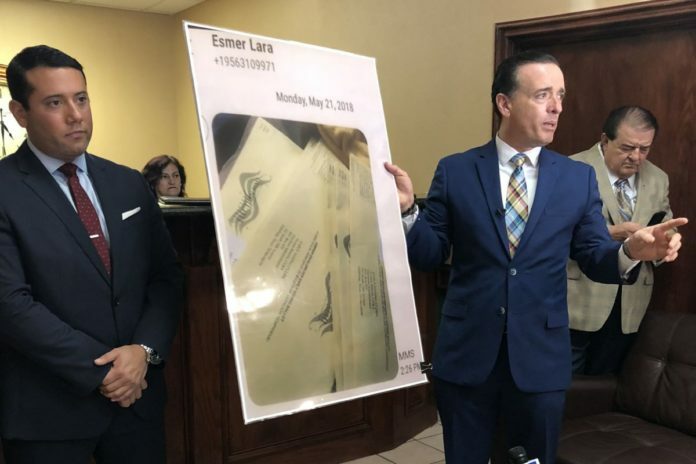 Lara was called to testify by Rick Salinas, whose case centered on allegations of illegal vote harvesting by the O’Caña campaign during the June mayoral runoff election, in which O’Caña was declared the winner and Beto Salinas was unseated after serving as mayor for nearly two decades. In rendering his decision to void the election, Judge J. Bonner Dorsey said he could not ascertain the true outcome of the election after witnesses testified to receiving money in exchange for their votes, or being illegally assisted in casting absentee ballots by mail. Attorneys for O’Caña filed a notice of appeal on Monday, staying the judge’s order and effectively delaying any plans for a new election until the appeals court makes its ruling. O’Caña, who remains mayor, has denied participating in illegal vote harvesting. Richard Gonzalez said Perez came forward after feeling that his integrity and character was in question in the wake of Lara’s testimony.